The hard-to-get-to town of Friedrichshafen in SE Germany is the unlikely setting for the World’s biggest bicycle trade fair. But for the last 11 years it has been home to Eurobike; and the bike industry loves to meet and greet there. 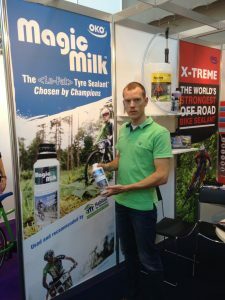 Since 2010, OKO has exhibited its range of bicycle tyre sealants and has become an established part of the bike scene, steadily adding to its range of international distributors. And 2016 began with the launch of the OKO range in the UK and Ireland through Madison, the biggest bike distributor. The 2016 Eurobike event has just closed and we have an unprecedented list of new contacts to follow up, partly thanks to our move to pole position in Hall A1, the most visible location of any tyre sealant brand. Look out for many new distributors being added to our already long list on the www.oko.com ‘Find a Distributor’ website page. This has been such a popular feature that some envious tyre sealant resellers have been writing to our distributors trying to poach them – a desperate move, doomed to failure. We’ve also widened our 26″ 2.40 max width MTB tubes to 2.50 to follow the fatter tyre trend, and we’ve responded to the new deeper-dished rims with 48mm length valves. All of our Presta valves are removable-core, so if your bike was supplied with fixed-core valves you can upgrade and get puncture protection all in one! And should you need extra sealing for a bigger hole, you are able to try injecting more Puncture Free. All the range is at highly competitive pricing. 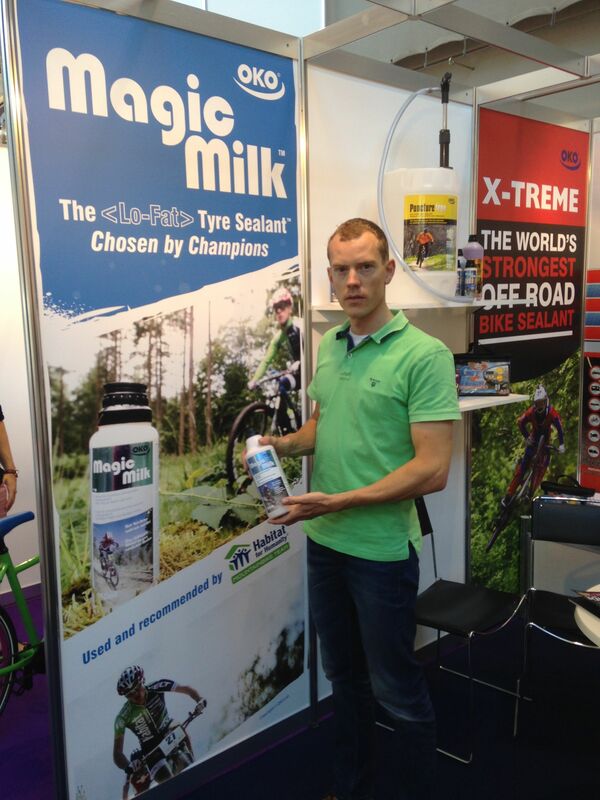 – and you can see why the 500ml size has become our best-selling line. The 1 Litre is growing fast too, being what the dealers and teams have been asking for. It also offers more product than the US brands. And speaking of the USA, if you are a distributor there, we want to talk to you… and like Habitat for Humanity Mountainbike team did, you’ll want to convert from the current brand leader. OKO Get-u-Home™ is not the first compressor/sealant kit – but we only wanted to introduce one if it was the best. Check out our features and you will see why it outperforms even the expensive items produced as OEM for the car manufacturers. Whenever you want to pump up your bike or car tyres, you need a fast inflation and an accurate gauge. With others you often get overheating and an unreliable circular analogue dial. Get-u-Home™ is digital, accurate, and has an auto-stop at your selected pressure. If you are choosing a kit for your home and away use, make sure it offers a light – ideally a powerful LED one with flashing and red light warning options. And of course you want a sealant that has a pedigree based on 38 years of development and that won’t go beyond its shelf life before you need it. I think you’ll then want to seek out OKO Get-u-Home™: just as the sports shop and general retail operators are doing.